California legalized medical marijuana in 1996, since then the black market has exploded. Northen California has been especially hit hard. Please listen to Sheriff Honsal describe how marijuana has fueled crime, environmental damage, and the mental health and addiction crisis. A leading psychiatrist explains the latest research on cannabis. Colorado is the national pioneer of legalized marijuana. In 2014, it became the first state to allow any adult over 21 to buy weed or grow it without fear of prosecution. Since then, eight others and the District of Columbia have legalized the drug, and, with a momentum that feels irreversible, more are heading that direction. Stuart Gitlow MD, past president of the ASAM (Amer Society of Addiction Medicine) testified in the Senate hearing presided over by the pro pot Senators Cory Booker (NJ) and Kirsten Gillibrand (NY). There are testimonies by NIDA, the FDA, a pharmacologist from UC-Irvine but Dr Gitlow’s testimony is explaining how the current distribution of the psychoactive drug (marijuana) has enormous potential to harm our public health. Please listen to Principal Ron Castagno’s excellent description of what marijuana does to students. From someone who has dedicated his life to helping students achieve. “But we must be careful, since the evidence we have reviewed suggests that cannabis, like other psychotropic drugs, has negative as well as positive effects. When you consider that almost 200 million people worldwide use cannabis, the number of people who suffer cannabis-induced psychosis is likely to be in the millions, and the number at risk for developing serious mental health problems becomes a huge concern.” Beginning in the mid-1980s, European psychiatrists like me started seeing an increasing number of previously well-functioning teenagers who had developed hallucinations and delusions: the characteristic picture of schizophrenia. These troubled patients puzzled us because most had been bright and sociable and had no ties to the usual risk factors such as a family history of the disorder or developmental insult to the brain. Eventually the sheer volume of data convinced European and Australian psychiatrists of a link. Cannabis is now generally accepted as a cause of schizophrenia 23-24 (though less so in North America, where this topic has received little attention). Argument does continue over just how significant cannabis-associated psychosis is. 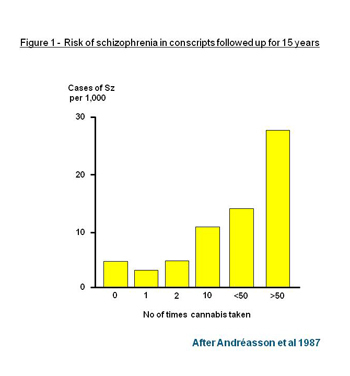 In different countries, the proportion of schizophrenia attributed to cannabis use ranges from 8 to 24 percent, depending, in part, on the prevalence of cannabis use. By: Sir Robin Murray, M.D. ( Read Q&A with Sir Robin Murray, M.D. ) Studies that have tied cannabis use to schizophrenia in the developing brain are just the tip of the iceberg when it comes to marijuana. Sir Robin Murray, the author of this month’s Cerebrum article, “Appraising the Risks of Reefer Madness,” first began to wonder in the 1990s why more and more young people were seeking treatment for psychotic symptoms in the United Kingdom. Many had been excellent students and athletes and socially active when—with no apparent family history of psychosis or trauma— they had started to develop cognitive problems and then hallucinations and delusions. Common in many of their stories was one familiar refrain: they were known to have smoked huge amounts of marijuana. We asked Murray, M.D., professor of psychiatric research at the Institute of Psychiatry at Kings College in London and former president of the European Psychiatric Association, to embellish on some of the points he makes in his article. 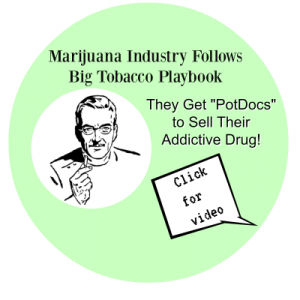 (The results of a six-year study lead to calls for more public awareness about the effects of using a potent form of cannabis. On Marijuana: Q&A with Sir Robin Murray, M.D. Sir Robin Murray, the author of this month’s Cerebrum article, “Appraising the Risks of Reefer Madness,” first began to wonder in the 1990s why more and more young people were seeking treatment for psychotic symptoms in the United Kingdom. Read more excerpts from the interview. (Jim) Gerhardt (police sergeant in Thornton) relayed grisly stories of marijuana-intoxicated individuals committing gruesome suicides or even murders, dismissing claims by proponents that users tend to mellow out. Gerhardt ticked off a laundry list of negative impacts since legalization in his state, from an increase in marijuana-related suspensions and expulsions among school-aged children to a reported rise in veterinarians treating dogs for toxicosis caused by pets either inadvertently ingesting the pot or purposely being fed the drug by their owners. Massachusetts law enforcement not ready for marijuana legalization, Walpole police chief John Carmichael says. Law enforcement officials are not prepared for the legalization of recreational marijuana, Walpole Police Chief John Carmichael said. The Campaign to Regulate Marijuana Like Alcohol is seeking to place a question on the November statewide ballot legalizing marijuana for recreational use.